I'm still sorting through how I'll generate cash for spending in retirement. My plans are to tap investments as needed and desired in sync with Social Security benefits, pension income, and other income sources to be determined. My goals are to preserve my investment principal while also giving charitably to causes that enrich others' lives and spending in a way that allows me to enjoy life. A retirement rule of thumb that surfaces regularly in regard to using investments is the 4% rule or 4% withdrawal rule. It seems wise to understand this rule, not to dictate plans but inform readings on the topic of retirement, facilitate conversations with financial planners, and guide self-developed plans. When I considered this rule, I wondered about its pitfalls as did Jason S. Scott, William F. Sharpe (the Nobel Prize winning economist), and John G. Watson in The 4% Rule – At What Price? One problem is the possibility that a fixed withdrawal amount, adjusted for inflation, may deplete the investment portfolio; this situation leaves the retiree scrambling to generate income from sources other than investments in his or her old age. Another is the reverse possibility that investments could support higher withdrawal rates but income is still restricted; this scenario means that the retiree scrimps unnecessarily. Since its development, popularity, and notoriety, the 4% rule has been studied, tested, rejected, and modified to address concerns. Understanding how it's supposed to work and under what conditions offers insights for retirement planning. The 4% rule was developed by Bill Bengen, an investment advisor as a way of quantifying safe withdrawal rates for retirement planning purposes. Drawing on historical data associated with market returns and inflation rates, an investment balance of any size could generally survive 4% siphoning of its dividends, interest payments, and/or capital gains every year, adjusted for inflation, for a retirement of 30 years. That is, if you retire at 65 and live until 95, you could take 4% of your starting investment balance every year of your retirement, adjusted for inflation and not run out of money before you die. The withdrawal amount in the first year is based on the portfolio balance; in subsequent years, it's calculated using the starting withdrawal amount and inflation. From a planning perspective (not necessarily a realistic one), the annual withdrawal amount supports a steady retirement income, which remains constant in terms of spending power. If you're a regular investor, you'll know that investment returns aren't guaranteed, fluctuate from year to year, and may not exceed 4% in a given year. If investment returns are greater than the withdrawal rate in a given year, the portfolio balance increases. If returns are negative or less than the withdrawal amount, the balance declines. Each year, the portfolio balance grows or shrinks; such happenings are recognized and integrated into this rule from a historical, back-tested perspective — though not in terms of predicting the future unless it acts like the past. 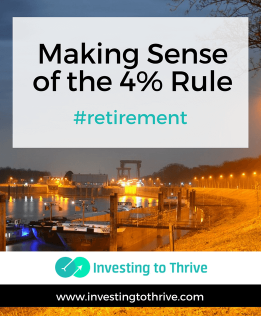 Again, the purpose of the 4% rule is to suggest a withdrawal rate that, consistently, in all types of market conditions (including the worst investing climates historically), will generate income throughout a specific term (30 years) of retirement. The 4% rule indicates the safe amount of annual withdrawals from an investment balance. As an important aside, this level of safety is also called the confidence level by economists and success rate by financial planners. According to The 4% Rule article, Bengen developed the initial rule without mentioning its safety, potential success rate, or confidence level. The original idea is that the rule would work, period, so there wasn't the need to say how often it would work. Subsequent studies have indicated the success rate in various scenarios, which involve varying levels of equity exposure and withdrawal rates. There's also been the suggestion to adjust withdrawals and spending during market downturns in order to preserve principal and improve the success of the retirement (that is, not run out of money). As I consider retirement, I want to be able to project my annual income in a way that is predictable and I imagine that most people do also. The idea of being predictable using volatile assets is flawed but for the moment, we'll follow the 4% rule and see where it leads in terms of income planning for retirement. There are two ways to approach planning. The first is to wait until I'm ready to retire and then look at my retirement portfolio, figure the withdrawal amount, and plan my budget around this number. The second way is to use my income goals to drive my plans for accumulating a retirement portfolio. Let's say I'll want to spend $50,000 each year in retirement. If I have no other income streams (not even Social Security benefits) and plan to generate all of my income from my investments, then I'll need to accumulate approximately $1,250,000 ($50,000 / 4%) or ($50,000 x 25). I could ease up on the investment portfolio's requirements by considering income from other sources, such as a company pension, Social Security benefits, and income from a business or part-time job. At the same time, I could trim my budget. In this scenario, let's say I'll get $2,000 monthly from outside sources and find a way to reduce spending by $5,000 each year. The annual amount I'll need to generate from the investment portfolio falls to $21,000 [($50,000 – ($2,000 x 12)) – $5,000] and the requirement for the starting investment balance in retirement falls to $525,000 ($21,000 / 4%) or ($21,000 x 25). Now that I've figured out how the rule applies to my withdrawal amount, I'll consider asset allocation that's needed to consistently generate income and portfolio growth to fuel these withdrawals. The 4% rule is supported by allocating assets (stocks, bonds, and cash) in a certain way. There are many takes on appropriate allocation. According to Jane Bryant Quinn in How to Make Your Money Last: The Indispensable Retirement Guide, Bengen's “basic studies” assume a 50/50 allocation with 50% of money invested in the S&P 500 index and 50% in intermediate-term U.S. Treasury bonds. To achieve this allocation, she suggests low-cost mutual funds replicating these indexes. As the original 4% rule was studied and tested, rules regarding the asset allocation became more nuanced. Allocation mixes became associated with success rates at varying withdrawal rates (for example, 3% or 7%), rather than firm recommendations. Asset allocation could include more or fewer stocks based on the retirees' expected longevity, desire to leave a legacy in the form of an investment portfolio, capacity and tolerance for portfolio volatility, and other factors. Fidelity describes a balanced portfolio for retirement using the 4% rule as a 50/40/10 allocation: 50% stocks; 40% bonds; and 10% cash. A more aggressive portfolio (70% stocks, 25% bonds, and 5% cash) could allow higher withdrawal rates — if basic needs were met by what Fidelity refers to as “guaranteed” income sources, such as a pension. According to Michael Kitces, MSFS, MTAX, CFP, CLU, ChFC, RHU, REBC, CASL in “20 Years of Safe Withdrawal Rate Research”, reasonable stock allocations might vary from 50% to 75% throughout retirement. Some research indicates a “60/40 portfolio as a good anchor for a static allocation,” meaning that you could maintain a 60/40 stock/bond allocation throughout retirement rather than reducing equity exposure as you get older. Note that to keep asset allocations in check, you'll need to rebalance on a yearly basis. Figuring out an appropriate asset allocation is one of the factors in determining how this rule affects real life and plan implementation. Other areas to be considered include taxes. Income taxes can affect how the 4% rule meshes with your retirement planning. More to the point, how the money being withdrawn is taxed — as ordinary income for traditional retirement accounts, as long-term capital gains from regular investment accounts, or as tax-free from Roth accounts — influences whether the withdrawal amount will match your desired income or cash flow. Kitces says “Bengen was an agnostic about taxes” initially, but later suggested refining the withdrawal rate and asset allocation to reflect varying tax situations. I think the agnosticism means that he doubted taxes affected the integrity of the 4% rule, rather than doubting the existence of taxes. These later revisions recognized the differences in tax rates for retirees, along with the potential need to generate more from a portfolio that's being taxed at ordinary income tax rates. Higher than expected tax rates pointed to the need to increase equity exposure to support higher levels of withdrawals. Whatever your tax structure, the take-away is that you'll likely need to make some considerations for taxes when planning. As a momentary digression from the 4% rule, I'll mention another technique for determining investment withdrawals. The percentage-of-portfolio withdrawal method considers fluctuations in investment balances on a yearly basis. It infuses both safety and freedom into retirement income planning. As an example of how this method might work, let's say you saved $500,000 for retirement and withdrew and spent 4% or $20,000 in the first year of retirement. If these investments grew by 10% in the first year, you'd have $528,000 at the end of year 1 [($500,000 – $20,000) x (1 +.10)]= $528,000. If the investments grew by 5% the second year, then you'd remove $21,120 in income in the second year ($528,000 x 4%) = $21,120 with a remaining balance of $532,224 at the end of the year [($528,000 – $21,120) x 1.05] = $532,224. If the investments lost money in the first year, say by 10%, but grew 5% in the following year, then the numbers would look like this: $20,000 in income for the first year with an end-of-year investment balance of $432,000 = [($500,000 – $20,000) x (1 + -.10)]. The second year's withdrawal would be $17,280 = ($432,000 x 4%), reflecting the previous year's decline in value. The ending balance would rise slightly to $435,456 = [($432,000 – $17,280) x (1.05)]. This technique uses the 4% rule as a starting point but adjusts withdrawals based on investment balances. This method could solve the problem of preserving principal but introduces the aggravation of adjusting withdrawals — and spending in retirement — based on year-to-year investment returns. Having lived briefly off investment balances during a market downturn, I've wondered about the wisdom of following the 4% rule. “Supporting a constant spending plan using a volatile investment policy is fundamentally flawed,” say economists Scott, Sharpe, and Watson about this rule and I agree. Yet, I yearn for some simplicity in planning. This rule gives me a starting point while I keep in mind things like taxes, cash flow, and sequence-of-return risk. What do you think? Are you using the 4% rule successfully? Do you have other methods for determining annual withdrawals?